MOPL provides HIPAA compliant cost-effective and quality-oriented medical transcription solutions to multi-specialty physician's groups, hospitals, outpatient clinics, therapy clinics, and individual and group physician practices across US. Our guaranteed 24 hour & less turnaround time delivery standards help you in revenue cycle optimization. With our policies and work ethics centrally focused on your satisfaction and revenue optimization, our unique MacroScribe Solution provides quality transcription services exceeding the industry standards of 98.5% quality. We focus on delivering unsurpassed quality, financial advantages, and user-friendly technology to help improve patient care and optimize your revenues. Since we understand that every facility has unique needs and requirements, we provide customized solutions devised after thoroughly exploring your needs. Our medical transcription services solution eliminates redundancies and unleashes efficiencies and savings that we pass along to our customers. Faxing Reports to Referring Physicians. Backup maintenance ensuring easy retrieval of files on demand. Unique feature that eliminates your trouble of retrieving patient’s old records for general follow up. Salaries, benefits, taxes (federal, FICA, unemployment, etc. ), and workers’ compensation insurance. Some of these are typically overlooked when calculating the true cost of in-house transcription. Comparing to these true costs generally makes a strong case for outsourcing medical transcription with cost savings typically estimated to be in the 20-40% range. Free Trial to test our service without any obligation. 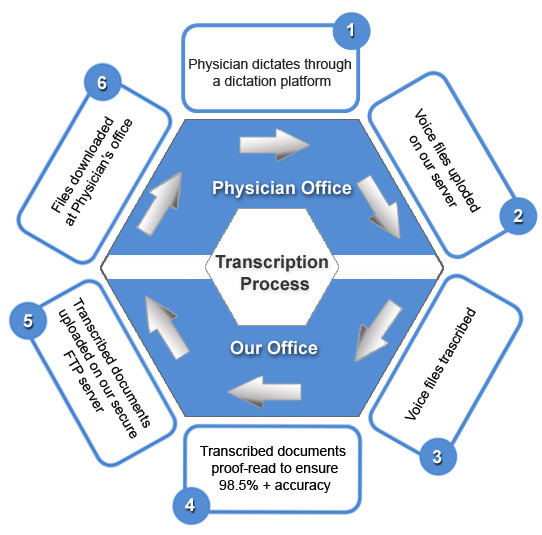 How the Transcription system works and what are steps involved. The Physician creates a voice file by speaking through a dictation platform. Voice files are sent (uploaded) from the doctor's office to be received by us. The transfer would depend upon the choice of dictation platform. If needed, we would provide the necessary guidance in this regard. Voice files are received (downloaded) and transcribed by us. Document files are sent (uploaded) from our office to the physician’s office through the Internet and are faxed to the referring physicians, if so desired, at a very nominal cost. Document files are received (downloaded) at the doctor's office. A printout of the document files is taken for filing and for any other required use of the doctor/facility. If desired by you, files are stored on the computer/backup computer to maintain the record in electronic form. The storage of dictation files and transcribed files is done as per your requirements. Generally, the dictation files are stored for 90 days and transcribed files are available and stored for seven years. What size facilities can MOPL support? MOPL provides medical transcription services to a wide range of practices, from single physicians to large multi-specialty practices. Since our solutions are customized to your needs, there is no minimum number of physicians required to sign up for our service. With a sound financial backup and scalable infrastructure, we are always ready to meet requirements of large organizations as well. What type of specialties & reports can MOPL handle? Since we have been providing services to multi-specialty practices for a number of years, no specialty has remained untouched. We have experience of transcribing a wide variety of reports including but not limited to Office Visits, Consultations, Followup Visits, Operative Reports, Radiology Reports, Lab Reports, etc. Moreover, with a pool of seasoned and credentialed transcriptionists and quality analysts, we are always on to meet the requirements of any specialty. We are a large group/hospital and want to partially outsource our transcription needs. Do you take up partial assignments also? We understand that every facility has unique needs and requirements and may want to partially outsource its work; hence, we provide various solutions to satisfy your needs ranging from comprehensive transcription solutions to partial transcription solutions in turn helping you to manage the overflow. Our files are transcribed using a voice recognition software (VRS). Do you take up partial assignments of proof-reading/quality checking as well? Yes. As mentioned above, we provide various solutions to satisfy your needs ranging from comprehensive transcription solutions to partial transcription solutions. The files are checked for quality by our seasoned and credentialed quality analysts to provide you guaranteed 98.5% plus accuracy. How does MacroScribe ensure highly accurate reports consistently? MOPL commits to the quality standards set by the Association for Healthcare Documentation Integrity (AHDI, formerly AAMT - American Association of Medical Transcription) and utilizes the AHDI scoring process of variable point deductions depending on error type. We follow stringent three-tier quality assurance procedures at our end. At the first level, the transcriptionist would transcribe the file and then would recheck for any errors. At the second level, quality analyst would check for any errors and would produce an exportable product. At the third level, a highly qualified and experienced quality assurance personnel would randomly check the files. Also, a highly qualified and experienced language specialist is available at all times to sort out problems at all levels. What is the security of the patient information? Doctor's office: The commonly used security features would be restricted access and to authorized personnel only, encryption, firewalls, non-disclosure agreement with people authorized to handle the files etc. Transcription Company's office: The commonly used security features would be restricted access and to authorized personnel only, encryption, firewalls, non-disclosure agreement with people authorized to handle the files etc. What would be the dictation platform? 1. Toll free service: This service can be made available on specific request. Doctors would pick up the phone and dial a toll free number for dictation and the files are automatically transferred by the company using 128-bit SSL encryption. 2. Dictation System: There are various companies in the market supplying the dictation system, viz, DVI, Lanier, Crescendo, Winscribe etc. The cost of such a system should fall in the range of USD 5000 to USD 20,000 depending on the number of ports, i.e., how many simultaneous users accessing the system. These are all good companies and their systems are widely used in the business and are successful. The option is convenient but high on upfront cost and low on running cost. 3. Hand held recorders: There are various digital recorders available in the market that cost anything between USD 200 to USD 400. The weight of the recorders is between 1 to 1.5 pounds and can be easily carried, allowing the flexibility to dictate. The voice quality is good. The option is convenient and also low on upfront and running cost. 4. Dictating on Computer: There are some shareware and some paid software available in the market whereby you can dictate on your PC. The voice quality is inconsistent, as one has to be careful about the distance of the mouth from the mic. Too far may make the volume very low and too close would make the voice blurred. The option is low on convenience but also has insignificant upfront and running cost. In our opinion, handheld recorders would be a good choice in the present circumstances. How long does it take to get started with MOPL? Since there is no IT restructuring and no special training required at your end, we can start on an immediate basis. Is there any provisioning of a trial period with MOPL? We understand that you want to establish your confidence in our services before fully or partially outsourcing your medical transcription needs to us and to help you in that we are willing to offer you a FREE TRIAL for a week to test our service without any obligation. Our physicians use different templates. Do we have a provision of using various templates with MacroScribe? Since we work closely with you and identify your needs on priority, templates being one of them, we provide customized templates suiting your needs and there can be different templates for different physicians and/or different formats for the same physician. What format are the transcribed files into? We transcribe reports in Microsoft Word formats as it is more presentable, editable, and searchable for you. However, if desired, we can transcribe the reports in any format you wish to. We are using an EMR program. Can MacroScribe files integrate with our EMR programs? Yes, our files smoothly integrate with EMR programs that have the provisioning of importing files. We sometimes require our old files. How long are the files stored and how can we get them? The storage of dictation files and transcribed files is done as per your requirements. Generally, the dictation files are stored for 90 days and transcribed files are available and stored for seven years. You can anytime request your Account Head for any files you need. MOPL's transcription services are priced highly competitively. Our MacroScribe transcription solution eliminates redundancies and unleashes efficiencies and savings that we pass along to our customers. Outsourcing your medical transcription needs to us would translate into cost savings typically estimated to be in the 20-40% range. Since our solutions are customized as per your requirements, we would be able to give you the best quote after analyzing your requirements. Please feel free to Contact Us to discuss this. That's great. We would like to use MOPL's MacroScribe transcription solution. How can we start? With no major IT restructuring, training, or investment required and no set up fees required, starting with MOPL is as easy as 1-2-3. Since our focus is on identifying your needs on priority and fulfilling them, to serve you better, we would need to know what would be the average volume of work per day in terms of number of lines/minutes of dictation to start with and how it is going to grow and up to what level. It would help us in planning the start and scalability need of our facility here. The list of the physicians connected to the hospital/clinic. The list of the physicians frequently referred. The list of the departments in the facility. Patient schedules (on a daily basis). Sample files, if available, for all the physicians for all work types so that we can read and prepare notes and understand individual physician's requirements. How do we transcribe Allergies, i.e., in bold, CAPITAL BOLD, underlined, or as simple text.